A further 4 apparatus wagons have left Kiruna Wagon’s workshop. 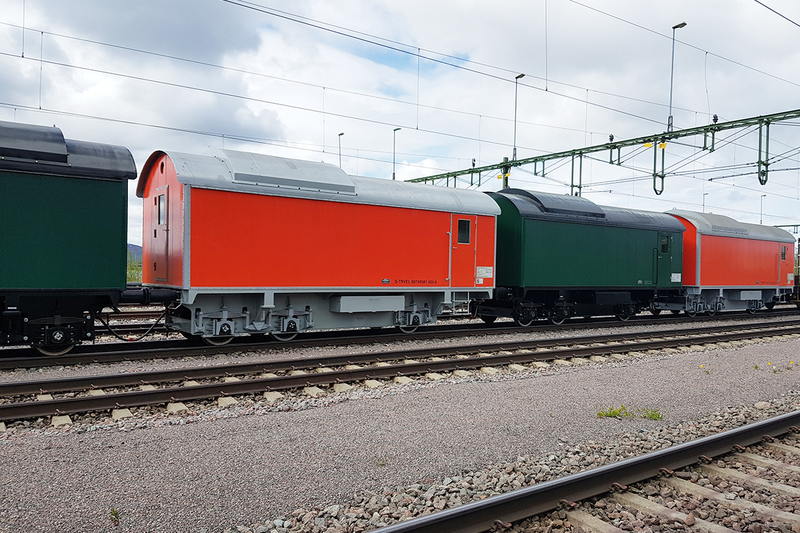 Two wagons have been delivered to the Swedish Transport Administration and two to our new wagon customer Euromaint – the Nordic region’s leading independent supplier of maintenance services for the rail transport industry. As a complement to our modular standardised products for ore logistics, Kiruna Wagon also carries out wagon upgrades and customisations. In the project, an older wagon model was redesigned with new suspension equipment and running gear to make it compatible with modern wheel axles, bearings and springs, etc. For the wagon body, lightweight materials in sandwich elements were chosen over a heavier welded construction. We are very pleased with the outcome of this customisation project and hope there will be more deliveries of this proven, but now also modernised wagon. Here you can find various press images and our company logotype. Find out about the opportunities that exist at Kiruna Wagon.